Today is Day 2 of the Distress Oxide Event that Josefine and I are putting on. We both fell in love with Distress Inks this year at Creativation in Phoenix when we were one of the first people to try them in Tim Holtz's workshop. I have a video that wraps up five techniques that you can do with Oxides and Josefine will carry on for the next two days with more videos on how to use them. I love how everyone can find something that is their taste since we both have relatively different styles - Josefine loves getting inky with mixed media techniques and I prefer to stay on the clean and simple side. I hope you enjoy it! Also super exciting! 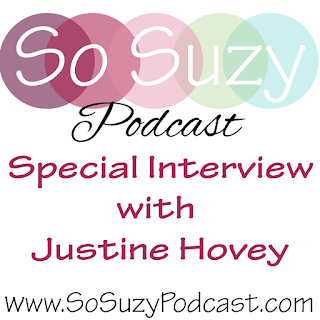 My interview on the So Suzy Podcast is now live! 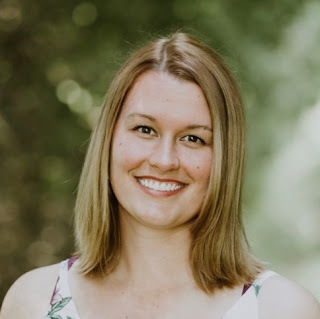 If you haven't heard of it before, it is a cardmaking podcast! You can listen here! 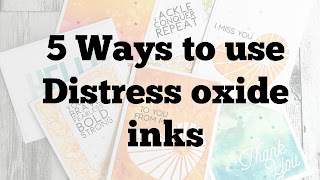 I am also giving away TWO sets of Distress Oxide Inks - one set today and one set went live yesterday, you can check out Day 1's video here or check out my list of giveaways on the right sidebar. 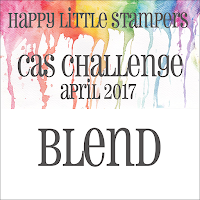 I am entering my card into the HLS Blend Challenge! Very nice and useful video, I can't wait to get to try these wonderful inks! My favorite coolor is Salty Ocean! 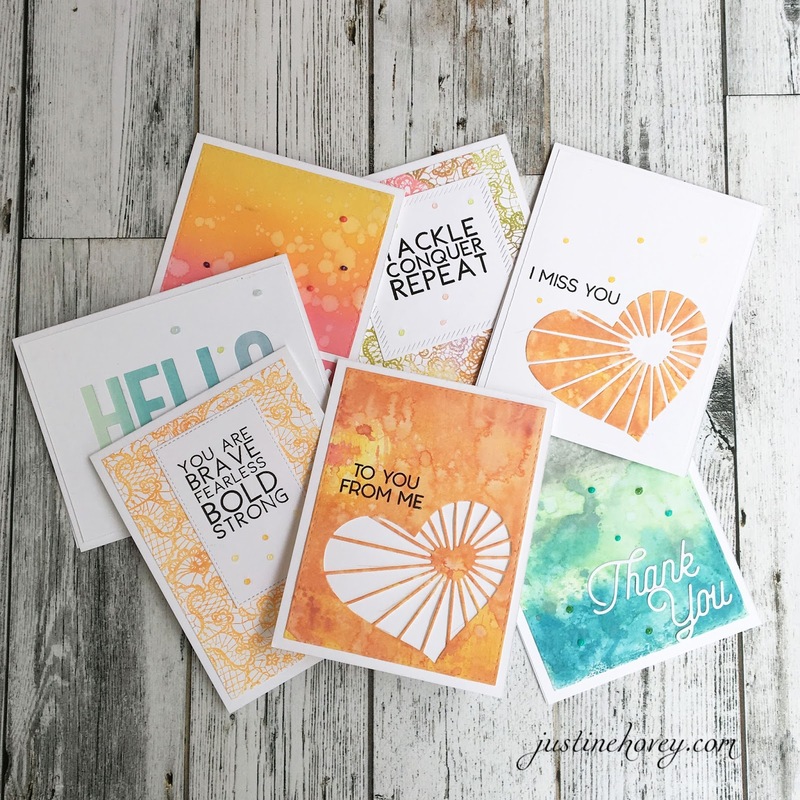 Good Morning Justine....I am loving your cards My Oh My how Gorgeous they all are. Loved watching you create away using your Oxide inks...the results is truly Spectacular and thanks for your Terrific Tutorial along with your Amazing tips, tricks & techniques. You really do take the mystery of being able to accomplish this technique. Thanks so much for the chance to win these inks..how generous of you. YOU so ROCK!! Love you Demi's and cards . I love your cards. They are fast, beautiful, and you the point. I only have 2 colors of Oxide so far (Worn Lipstick and Cracked Pistachio) and they're both gorgeous! Hi Justine! I really like your card techniques. Easy to learn from and pretty to watch! Thanks so much for this fun giveaway opportunity. 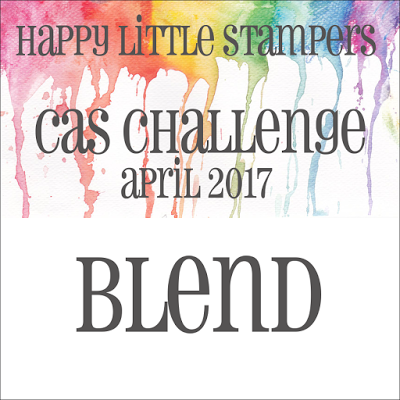 I do not own any of the distress inks so I would love to try them! Great video! I don't own and of the new distress oxide. But love distress inks. I just got to play with these inks yesterday...can't wait to get some for myself... love the cracked pistachio color! I am just getting in to the card making and I am still learning what all the stuff is. I found your channel from your hop, everyone said nice things about you and what you do. I hope to learn more from your channel! You are so talented! I love your cards! Thank you for sharing your work. It is hard to pick just one color,but two of my favorites are Peeled Paint and Icced Spruce. OMG! I've just finished to see your video and I'm in love for your awesome cards! Wow! Love all the Distress Oxide Inks but my favourite colour is Broken China! Love it!!! I'm usually a cool color girl but those oranges and reds and yellows were fabulous!!! Great timing for these tips! I'm anxious to try these inks out! Broken China is my favorite! Wilted Violet is my favorite color. All the distress oxide inks look great. Love all the different techniques you showed. 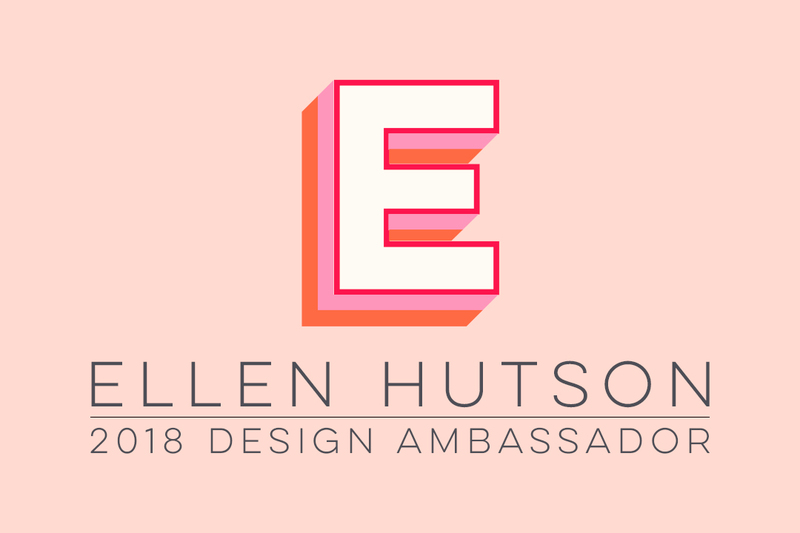 I tend to use pink in a lot of designs, and my favorite is the Worn Lipstick. I hope they come out with more colors. These inks looks great! I love the cards you made with the different techniques. If I had to pick one it would be cracked pistachio, but they all look gorgeous! Gorgeous cards! My favourite is the one you used the heart strings die by concord and 9th. Thanks for another great video. I think I have to get these inks! Cracked pistachio is probably my favorite. my favorite color is wilted violet! Thanks for sharing! Great video. Thanks for sharing all these ideas. I love cracked pistachio. 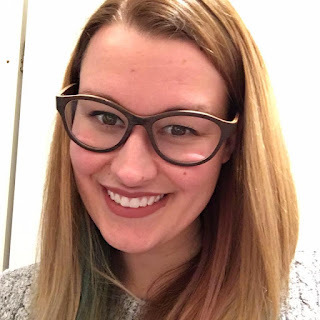 I also listened to Suzy's podcast today and it was nice to know more about you. I new to distress inks. ...and I'm loving the whole blending thing.. I really wanna try the smoothing. ..tfs! !! Love your cards! Very creative coloring! I wanna play with colors, hope I win!! Love your cards! Many great ideas for using these inks. Thanks for these videos, Justine! I'll be ready to jump right in when I get my oxide inks! I love all the colors - especially Broken China! I like cracked pistachio and broken China. The watercolor-type backgrounds you made were stunning, Justine! Thanks for sharing! Thank you for your videos! Now I KNOW that I have to add these to my stash. My favorite is Broken China. Great videos, Justine! 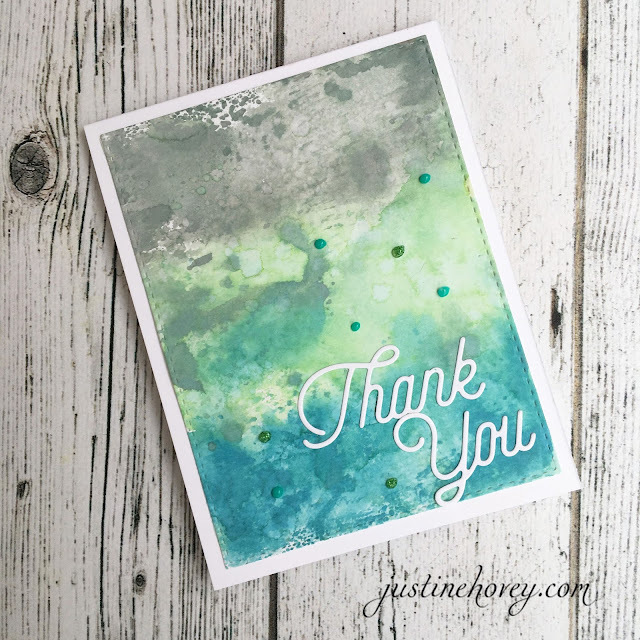 I love the effects and varied looks created with these new Distress Oxides Inks. I have made several trips to my local Hobby Lobby and Michaels, with no success in finding these inks there. ;-( So I am hoping, I win this give away, thereby reducing my carbon footprint on our beautiful planet. ;-) Please keep making these card tutorial! I cannot pick just one color! I love them all. After watching your video I need to get them all to play. So many fun options! My favorite distress oxide ink color is worn lipstick but honestly I love them when they are blended. There is just something about bending these that make me happy! I cannot wait until I get my set. I'm hoping to maybe get them for a holiday or something coming up. Or at least maybe get a few of them. I love the way these looks. Thank u so much for sharing!!!! Love these inks, hopefully I can win a set or buy some soon. I think the distress oxides have a lot of possibilities. I really like the wilted violet right now. lovely cards! 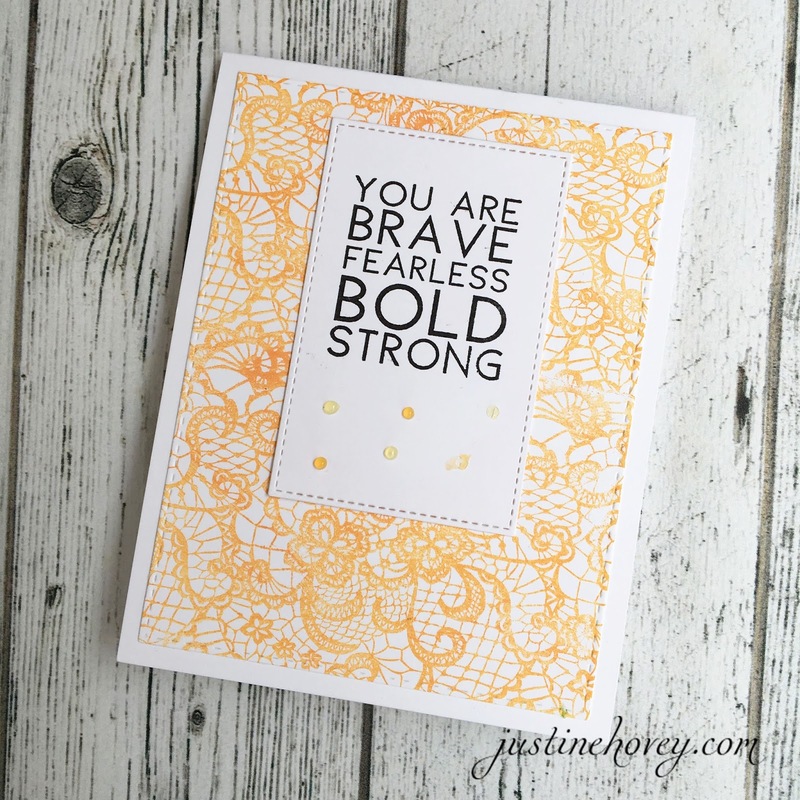 love the distress oxide inks! Favorite? Kinda like asking what's my favorite food - it depends on my mood! LOL! Thanks for this video - love seeing what all can be done with them! I like the examples and the different colors. I like Broken China. Thanks for showing us the different ways to use these inks. I think they're all gorgeous, but, my favorite is wilted violet! I love these inks! Cracked Pistachio is my favorite!! These are extremely versatile, my favorite color is worn lipstick, thanks for sharing all these wonderful techniques. Loved seeing all the fun ways to use these inks. My fave color is Wilted Violet. Thanks for sharing these techniques! Your cards turned out beautifully :) My favorites are probably cracked pistachio and broken china. I am so jealous that you have these inks. I am in Australia and am waiting for them to arrive. It was fun living vicariously through you today. It will hold me over until mine arrive. My favourite would have to be cracked pistachio. The Lace Background is calling me so hard. Your cards are stunning. Thanks for showcasing so much technique. These inks look amazing! My favorite is Cracked Pistachio, I also love Abandoned Coral. The Broken China is probably my favorite. That lace background is so pretty! My favourite is Wilted Violet but Spiced Marmalade is a very close second! Awesome video tutorial on 5 ways to use the new distress oxide inks, they all are such fantastic techniques and your results looked amazing. I really like them all, but will choose the Spiced Marmalade. Great technique video. I have never known what a difference distressed inks can make. I really love the looks it gives. Awesome colors that Tim Holtz has but my favorite is Red Barn. Love all those backgrounds! My fav color definitely is the wilted violet! My favorite is wilted violet. Love anything purple. 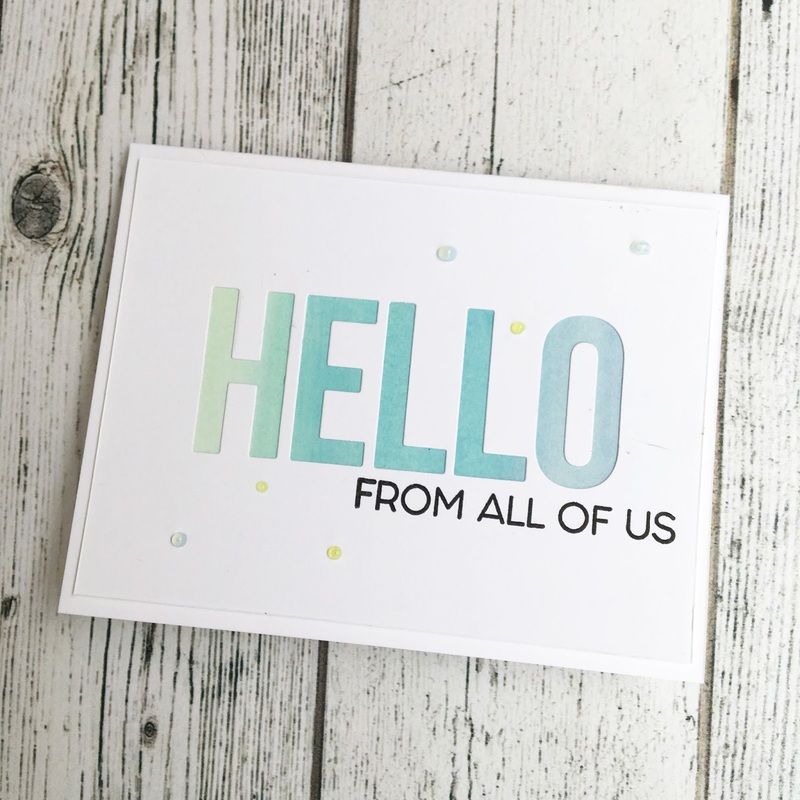 I love the new distress oxide inks! Thank you for all the helpful tips!!!! I so want to try to use these inks!!! Thanks for the lessons! Faded jeans is great but the spiced marmalade is shockingly bright ! I am loving the look of these inks! I have to get some, your backgrounds are just awesome! Broken china is my favorite. These inks are definitely on my wish list. Thanks for the inspiration and a chance to win. I really like the lipstick one. It seems very cute. Thanks for all the useful tips! Love all the cards! Haven't seen them in rl but so far I would say the Cracked Pistachio is gorgeous. Thanks for all the tips you gave. Oh my gosh Justine these are gorgeous! Those inks look absolutely amazing! Hard to pick just one color - I love the cracked pistachio with broken china and faded jeans - reminds me of the ocean. 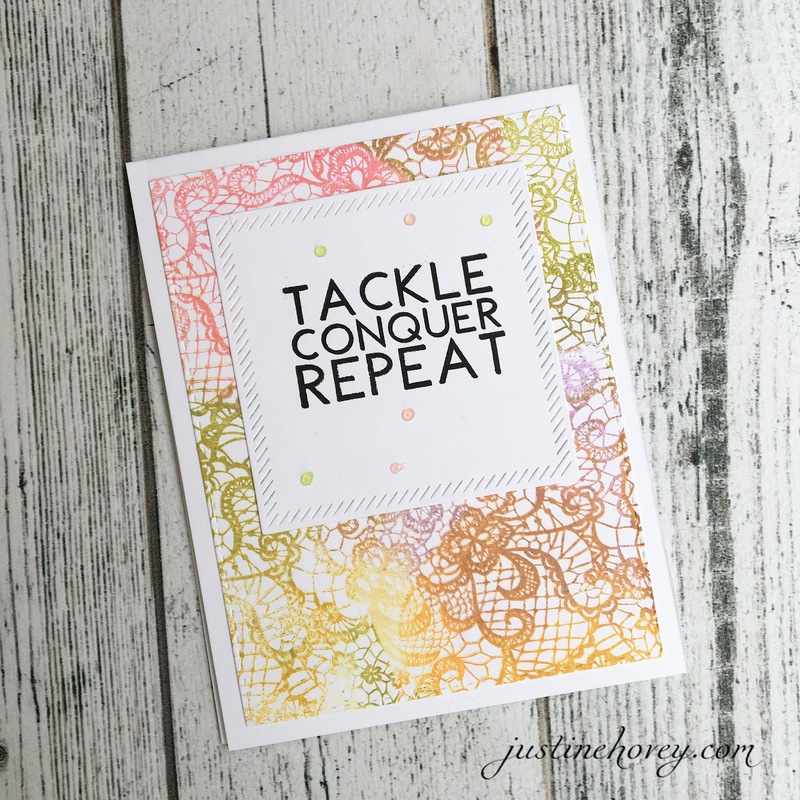 Thanks Justine for the reminder of ways to use distress inks. This new formula of dye and pigment inks looks like fun to play with. Good luck to everyone who has entered to,win this lovely set. The cards are gorgeous and now the more I see the inks the more I know I need them.Thanks so much for your information. It looks like these inks are great. Thank you for sharing you technique and tips! Beautiful cards and love the video! Thanks for sharing these techniques. I think my favorite distress oxide color is broken China. I think what I love most about these inks is that they will also stamp well love how the background stamp came out. I love these super cute!! I'm so glad I found your blog somewhat of a newbie I love seeing all the different techniques thank you!! I was about to buy distress inks when the distress oxide inks came out. I have been looking at videos to help me decide so this 5 day series is invaluable. It is difficult to pick a favorite color but I will go with Faded Jeans. I have to say that these cards are great. Love the techniques and will give them a try. Thinking now that I need them!!! Love your designs and techniques!!! I am loving these new inks but my fav is Broken China! Great videos, I am learning so many techniques! Thank you! Loved seeing all the different ways to use the new Oxides. I haven't tried stamping with them yet (I bought five to play with); gotta give that a try. Great video! I love all the colors. Wilted Violet is my favorite color! Thanks for the chance to win!! Thanks for sharing these techniques! The reaction these inks have with water is gorgeous! Wilted violet is my favorite! Thanks for this great tutorial! I am now all ready to try these inks, particularly Cracked Pistachio. Love your video which is so full of information. Wow! I will find a lot of uses for these gorgeous colors. Thanks for the opportunity! thanks for this wonderful video period I really like broken china and warn lipstick colors. Thanks for another great video! My favorite color is wilted violet. Anything purple!!! Thanks for sharing this, it helps a lot. 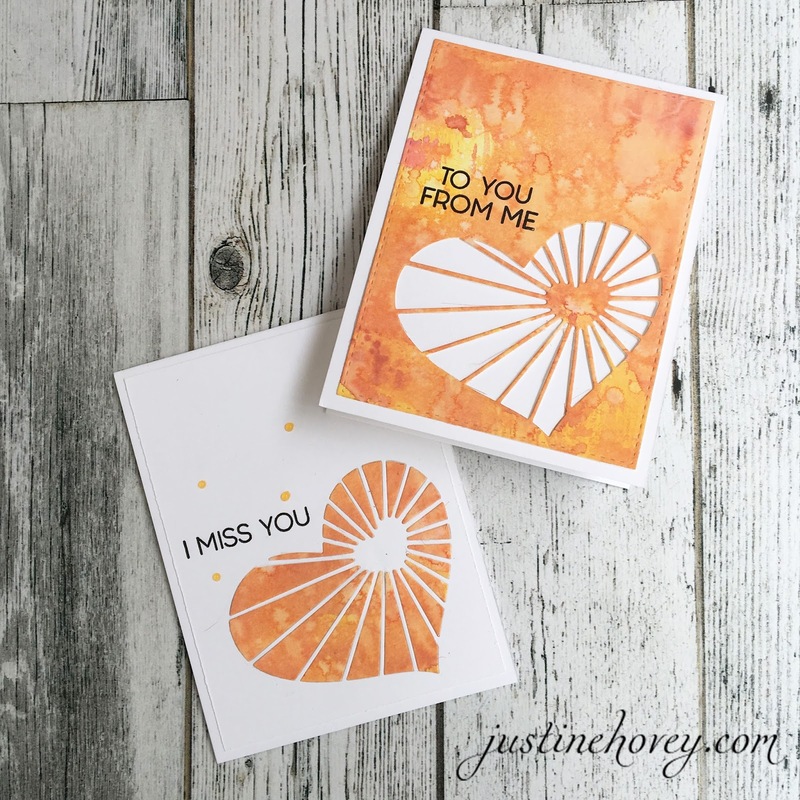 Fantastic creativity, Justine...these oxide inks are so appealing! Favourite: wilted violet...scrumptious! Thanks for sharing the techniques in the video. I've been wondering about these new inks. Great video Justin. My favourite colour is wilted violet. I just love the new TH DO inks can't wait to get a set. And love your cards. My favourite colour is broken china. I love the cards that you made. Umm so many delicious colours to pick from! I am going to go with iced spruce. Really helpful video thank you! Hi Justine,my favourite colour is Cracked Pistachio. Looks so refreshing! I ordered 7 colours today, unfortunately, they ran out of Fossilized Amber. Boo! All the colors are fantastic as are your cards! Would love to play with these inks! Soo hard to choose my fave color...Worn Lipstick is awesome! Can't wait until he releases more colors in the oxides! Your cards and techniques are so pretty! Enjoyed your video too! My fave color is Cracked Pistachio. The Distress Oxides look amazing. I love the cards you've made with them! I love these cards! I also love spiced marmalade oxide ink! cracked Pistachio is my favorite color of oxide ink. I love all your cards, they are so pretty! Thank you for these fabulous ideas! I've slowly began collecting the Distress Oxides because they look like a lot of fun and I'm excited to try your ideas! Cracked Pistachio is my favorite color. 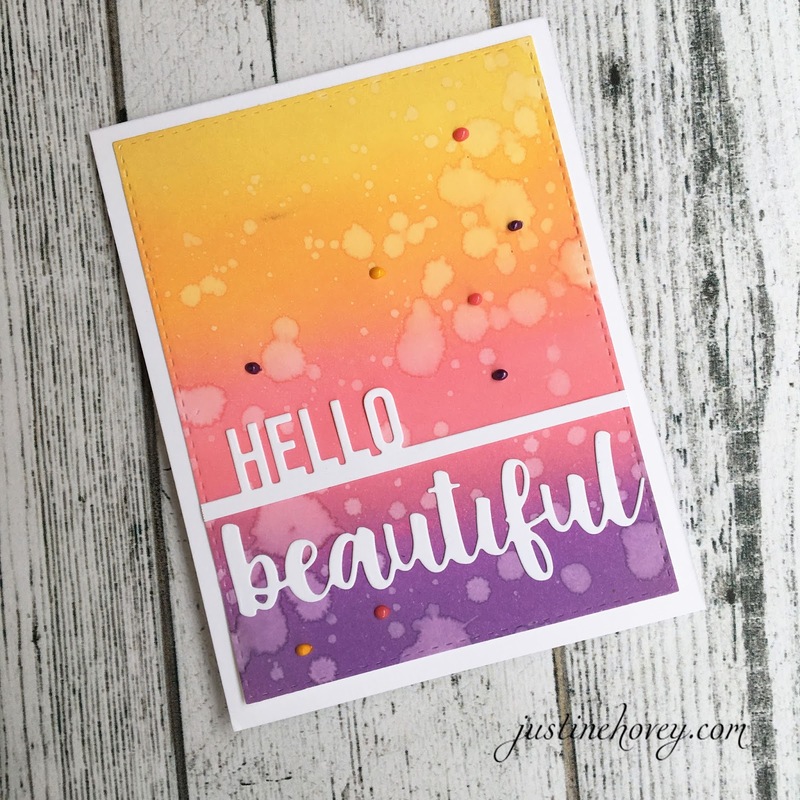 Loved the 'Hello beautiful' blended background card! And my favourite shade of distress oxide ink is probably the wilted violet. I like all of the colors, but I think I like the Broken China the best. 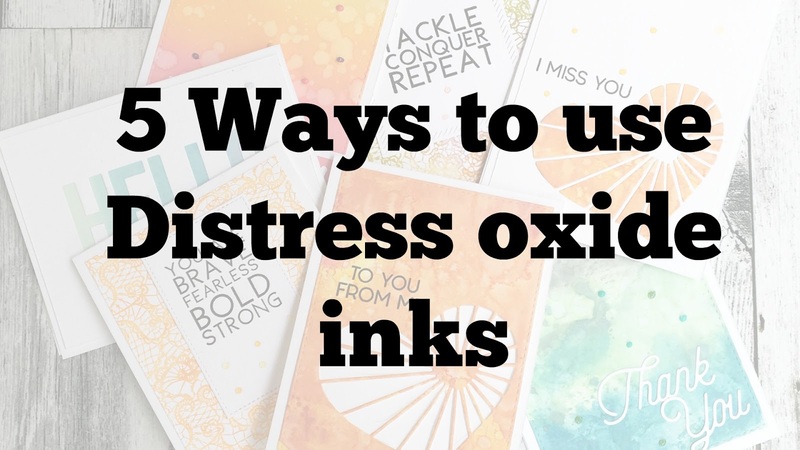 It would be great to have a chance to play with these new Distress Oxide Inks. I like the spiced marmalade and I loved your video! I love spiced marmalade! These cards are beautiful!! Broken China makes my heart sing! Cracked Pistachio is my favorite! Love every one of the cards! Thank you for sharing all the techniques of using Distress Oxide inks. All the colors are beautiful but I especially love Broken China!! 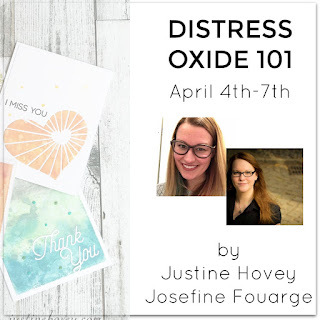 I loved the product when I first saw it introduced by Tim Holtz, but wow you definitely took my love for distress oxide to a whole new level! Loveee your cards!! Wow!!! All cards are gorgeous!! I think the cracked pistachio is my favorite!! I couldn't settle for one favorite color, but I love the combination of broken China and cracked pistachio! I find that blues and greens make for beautiful feminine and masculine cards. I can't wait to try these awesome inks! so many wonderful card! The colors of the distress oxides are really interessting. I love those vibrant colors. 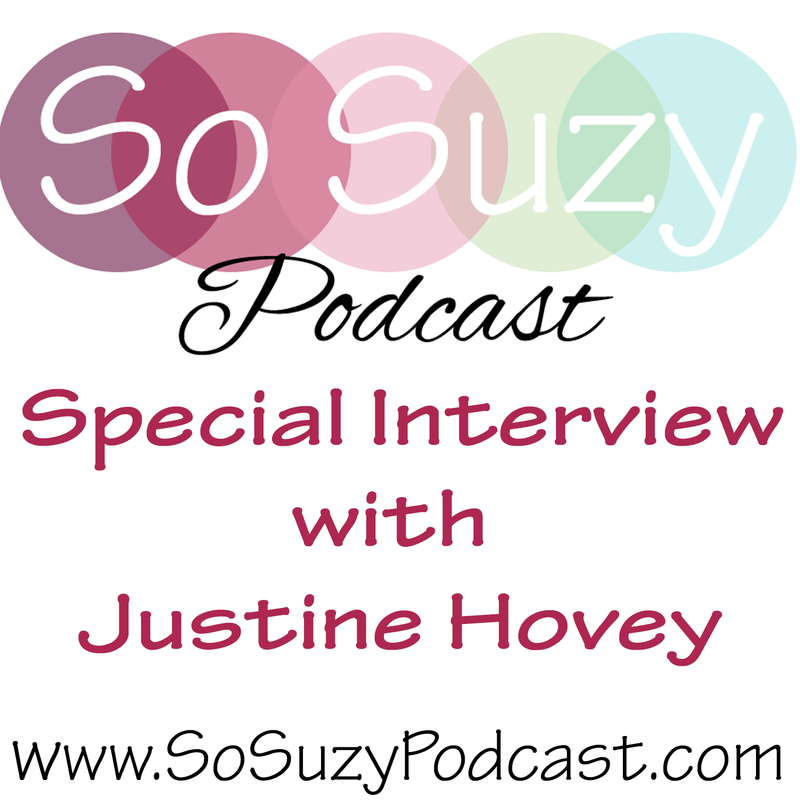 This was a very helpful overview, Justine! Your cards are so beautiful!! Oh and my favorite colors are cracked pistachio and worn lipstick! I like the Broken China. My favorite it Broken China, thank you for sharing these techniques with us. I have only been able to play with mine for a little bit & love all the possibilities that they have! I would love to get a set mor my crafty daughter! I can't wait to give some of your inspiration a try & thanks for the awesome giveaway! I really want that heart diecut after you made that card. That is just gorgeous! Cracked pistachio is my fav! No, spiced marmalade...! Thanks Justine! Worn lipstick! I am a pale pink woman! Worn lipstick is my favorite. The cards are beautiful. My favourite is spiced marmelade, yum! I'm loving the look of these in your pretty projects! Peacock Feathers is my favorite Distress, so I assume it'll be the same in Oxide. It's got to be spiced marmalade for this Brit! Love the techniques and projects. I'd love to try the Distressed Oxide Inks. Sooooo excited about the Oxide inks! Hard to pick just one color but I'd have to go with broken china (today anyway lol). I love the way it looks on technique #5 - creating a background. I really like the yellow! Beautiful cards, LOVE these new oxide inks! My fave is Wilted Violet. These cards are all truly stunning! I love the look of the Oxides, they must be a dream to use. If I had to pick one fav it would be Broken China but they all look delicious! thanks for the tutorial! my fave is worn lipstick. Great tutorial, and thanks for the opportunity to win. It's hard to choose a favourite, but probably Wilted Violet. I'm least fond of Walnut Stain and Vintage Photo, but that is not to say I don't like them. I just happen to enjoy brighter, bolder colors. I'm now officially a convert as I wasn't sure I wanted the new Distress Oxides inks but no more! They sure do look like they blend more easily and I love how water reacts with them. Tim Holtz's creative genius continues to amaze me. I don't know what color I would pick as my favorite as I don't have any yet, but from what I have seen on tutorials and online - I'll go for Cracked Pistachio with Worn Lipstick as a close runner-up. Thanks for all the great ideas! These inks are so awesome & your cards are wonderful. My favorite color would be Worn Lipstick but then I do like Broken China... , No, it would be Worn Lipstick> I love that one! My favorite color is Spiced Marmelade. Such fun techniques! Thanks for sharing!! Really like the cards! I love Broken China! I don't have distressed inks yet, but they are now on my Must Purchase list! I guess I never knew how many uses you could get out of them. I think mine is Broken China, I love this shade of blue. I'm not sure what the names are, but I love all greens.